Atmospheric autumn scenery of Ainokura, Japanese mountain village, with historic Gassho-style houses, rice paddies, vegetable patches and fog covered mountains. Ainokura, Toyama prefecture, Japan. 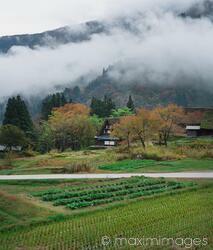 Rights-Managed photo of Atmospheric autumn scenery of Ainokura, Japanese mountain village, with historic Gassho-style houses, rice paddies, vegetable patches and fog covered mountains. Ainokura, Toyama prefecture, Japan 2018. Gasshō-zukuri 合掌造 Minka 民家, farm buildings. 相倉合掌造り集落 相倉 This image is available for licensing for a variety of editorial and commercial uses in publications, designs, web and social media. 5100x6000 px, 87.55MB uncompressed / 11.41MB jpg. Need larger? This Rights-Managed stock photo 'Atmospheric scenery of Ainokura Japanese mountain village historic houses rice paddies vegetable patches in fog' is created by Alex Maxim and can be licensed for your advertising, corporate, editorial or other use. Click 'Buy Usage Rights' to estimate the license fee and add the image to cart. Licensed files are delivered electronically as soon as the payment is processed.